HÀ NỘI — Forty-eight cyclists withdrew from the seventh stage of the Mekong Delta Cycling Tournament due to bad weather yesterday, the event’s organisers announced. The 177km stage was from Cà Mau to Long Xuyên City. “Bad routes and weather kept some young cyclists behind the others so they gave up,” said coach Đỗ Thành Đạt of VUS-HCM City team. 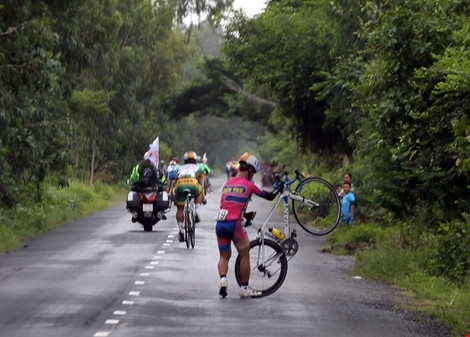 According to referee Bùi Ngọc Trung, it is the first time ever two thirds of cyclists have dropped out of the race. Mai Nguyễn Hưng of VUS-HCM City beat Huỳnh Thanh Tùng of the Military Zone 7 to win the stage with a time of 4:19.24. Nguyễn Thành Tâm of Gạo Hạt Ngọc Trời retains the yellow jersey for best overall time and Lê Văn Duẩn of VUS-HCM City took the green jersey award for most points with 142.